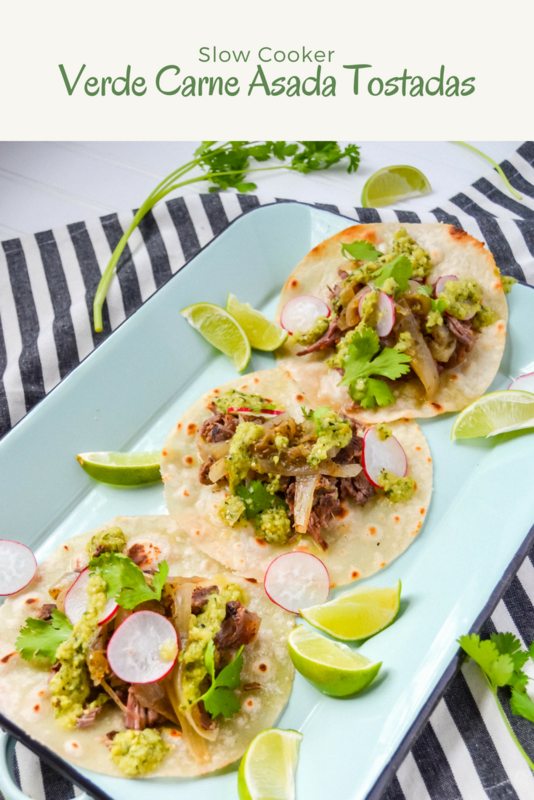 Verde carne asada tostadas that are slow cooked and served on a crisp cassava and coconut grain free tortilla! In honor of my husband’s favorite, I am sharing the recipe for my slow cooker carne asada tostadas with salsa verde. I have even used his favorite for this recipe -- steak! You can, of course, use whatever protein you desire, but the key ingredients are my homemade salsa verde, onions, garlic, and beef stock. This recipe is super versatile, easy, and delicious.I love this recipe because I get to use my slow cooker, so not only are you getting the juicy and tender meat you are saving time! Sundays are typically designated as my meal prep day so I will start a batch first thing in the morning. By the time dinner comes around, my husband and I will have dinner ready for that night and for the rest of the week! Tostadas are a super fun way to enjoy carne asada. Who doesn’t like a good crispy fried or baked tortilla?! For this recipe, I love using Siete foods cassava and coconut flour tortillas. I pan fry them with a couple tablespoons of coconut oil. There is just something about these tortillas that just take the recipe to the next level! Have fun with adding your favorite toppings! I like to keep it simple with cilantro, sliced radishes, avocado salsa verde, and a squeeze of lime. Season beef steak with a generous amount of salt and pepper. Heat a skillet over medium-high heat with 1 tbsp coconut oil. Once the pan is hot, add the steak to the pan. Sear the steak for a few minutes on each side. You just want a nice sear; not actually cooking the steak. Turn your crockpot on high and add the seared steak, salsa verde, onions, garlic and beef broth until beef is fully submerged. Cook on high for 5-6 hour or until beef steak is falling apart. While the mixture is cooking, use this time to prep the toppings you will be using for the tostadas. Turn the crockpot off and wait for the meat to cool. As the beef mixture is cooling, in a frying pan, heat 1 tbsp coconut oil on medium-high heat. Once the pan is hot, drop one tortilla in until it starts to brown, flip and brown, cooks in about 1-2 minutes. Continue until all tortillas have been fried. Let rest on a paper towel to absorb excess oil and sprinkle with salt. Layer the tostadas with the verde carne asada, chopped cilantro, radishes, then drizzle with avocado salsa verde and squeeze of one lime wedge. Layer with additional ingredients, serve and enjoy!